Post by Sup Mar Balear. Euro Tour. Week #… (I dunno, I’ve lost count). Italy. I know it sounds crazy, but there was actually a SUP race happening somewhere other than Hawaii on the weekend. While Connor, Travis, Sonni, Jenny and co. were battling it out across the Ka’iwi Channel, all the way over in Rome, Italy there was a very solid crew competing at the Italia Surf Expo’s SUP Challenge. Despite going up against a talented string of Euro boys, as well as Aussie whipper snapper Jake Jensen, in the end it was the Danish Viking, Casper Steinfath, taking out the crown and capping off a memorable summer of racing in Euro land. Casper, who looks like he was getting right into the Italian fashion culture, took out the sprints on day one before backing up with a 2nd place in the distance. Jake Jensen was nothing if not consistent, bagging a pair of thirds to claim second overall, after Leonard Nika (2nd in the sprints) dropped down to 6th in distance and 4th overall. Young Saffa Dylan Frick put on one of the biggest shows, capping off his mammoth trip to Europe with a win in the distance race and leapfrogging up into 3rd overall for the event. Rounding out the top 5 after Leo was Spaniard Roman Frejo. Over on the women’s side it was a dominant performance from Mallorca’s Laura Quetglas, who made it a clean sweep of the event with a pair of aces. Susak Molinero was her nearest rival. Italia SURF EXPO’s SUP Challenge was part of the Stand Up World Series’ European Cup, which also included the Euro Tour races in Bilbao, Oleron, Finland and Fehmarn. Post by Italia SURF EXPO – The surf culture & music festival village. This event also, surely, puts an end to the Euro Tour. 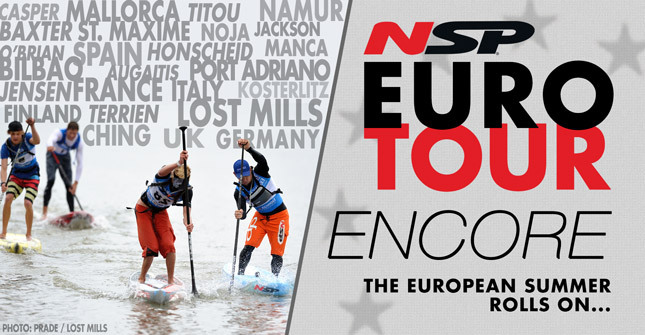 We started this totally unofficial but completely awesome tour back in mid-May as our way of celebrating the SUP racing culture in Europe. We expected it to finish up towards the end of June, as it’s done in previous years. However in 2014 Europe just couldn’t get enough of stand up paddling and the “Euro Tour” season ran for two and a half months right through til the end of July.